Here's the good, bad, and ugly of taking sleep medications (prescription and over the counter). Prescription sleeping medications work fast, they are usually effective for falling asleep on the first night, and involve no effort on the person who takes the pills. Just pop the pill shortly before bedtime (follow label instructions exactly!). Use of prescription sleep medications can provide benefits to severely sleep deprived people. They can help break patterns of poor sleep, help them get some sleep relief, so they can then work on the problems (medical or psychological) that are causing their insomnia. Prescribed sleeping medications are now safer than they were back in the mid 1990s. For people who have trouble falling asleep (sleep-onset insomnia), a new class of melatonin receptor agonist drugs, called ramelteon, may not be as habit forming as other drugs. For people who wake up in the middle of the night (called sleep maintenance insomnia), there are now prescription drugs specifically to address this problem. Overdosing on sleeping pills is not as big a risk as it was with sleeping pills of the past. People with serious sleep disorders other than insomnia may benefit from skillful use of sleep medications administered by a sleep specialist. Most experts recommend they should not be taken for more than a few days to a few weeks (maximum). Why? 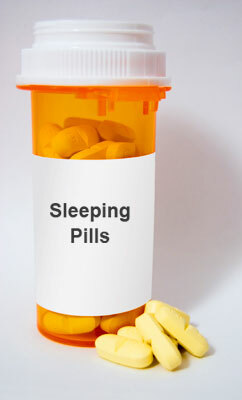 Some sleep medications can become habit forming (countless numbers of people have become "accidentally addicted"). Sleeping medications known as benzodiazepines are known to cause addiction. Also, long-term safety of sleeping pills is not known and more studies are needed. 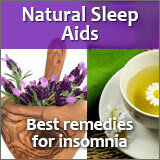 Long term use is frequently ineffective for lasting relief from insomnia. Long term use can also lead to tolerance and the need for higher doses of the drugs. This can be especially true for over the counter sleep aids (also called otc sleep aids), which is why they should not be used for longer than a week. The quality of sleep for people who depend on sleep medications is usually not satisfying. People may report only a few days of decent sleep or perhaps just four or five hours of good sleep at night. There can be problems with withdrawal when the drugs are stopped. This can include agitation, anxiety, and insomnia that's worse than when the drug was started. This is known as rebound insomnia. 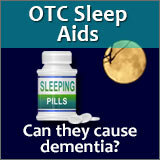 The lasting harmful effects of sleeping pills may not become apparent for many years. A 2003 study showed that older women who were taking high doses of benzodiazepines had greater physical decline over the years than women who did not take sleeping pills. Researchers had been studying these women for years and the gist of their findings was that the longer these women took the sleep medications, and the higher the doses, the greater was the physical decline of their bodies. Sleeping medication can interact negatively with other medications and alcohol. There are possible risks for women who are pregnant or breastfeeding. People who have kidney or liver disease, respiratory problems, depression, or sleep apnea are also at risk. Side effects of various sleep medications can include: dizziness, falling down for older adults, memory problems, morning hangover, daytime drowsiness, driving a car around town or eating while asleep and not remembering it, sleepwalking, headaches, suicidal thoughts, nausea, severe allergic reactions, and constipation. According to several studies, regular use of prescription sleeping pills can increase the risk of skin cancer. Over the counter sleep aids Over the counter sleep aids may cause restlessness because they contain antihistamines (the active ingredients are diphenhydramine and doxylamine). See my two articles below on the dangers of over the counter sleep aids. Chronic use of some of the otc sleep aids can rapidly lead to dependency to the extent that a person can't sleep without taking these drugs. The main over the counter sleep aids are Benadryl, Nytol, Sominex, Nyquil, Advil PM, and Tylenol PM. Doctors who prescribe sleeping medications may not be treating the underlying causes of sleeplessness. There may be depression or stress in a person's life that should be dealt with rather than masking it with sleep medications. If you're suffering from insomnia, stress, or wake up unrefreshed, I highly recommend this advanced natural sleep remedy. It can be used by adults and children 12 years and up. It sure beats taking potentially dangerous sleeping pills. And for stress, anxiety, and low mood, you may find Neuro-Natural Serenity helpful. Absolutely nothing I have said in this article should be construed as personal medical advice. 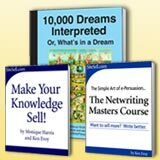 It is merely what I have studied from countless sources of reliable information (see a few of my references below). I am not a physician. Do not rely on this information for making a decision about sleep aids. Never under any circumstances attempt to withdraw from a sleeping pill or other medications without the strict supervision of a doctor. The best treatment for insomnia is cognitive behavioral therapy (CBT) which includes lifestyle changes. But most people don't stick with CBT, which often takes eight weeks to produce effective sleep. However, the effects of CBT can last for the rest of your life. To consistently get a good night's sleep, you must work at it. It doesn't just happen by accident. It's a lot like trying to lose weight or learn a new skill—it takes persistence and determination. And people who do not rely on sleep medications to treat their insomnia have better long-term sleep success, as well as better sleep quality. There are too many good references to list so I'll just list the ones that I found most interesting. Review: Sedative-hypnotics increase adverse effects more than they improve sleep quality in older persons with insomnia. ACP Journal Club; Jul/Aug 2006. Vol. 145 Issue 1, p14-14. Prescription sleeping pills: What's right for you? Mayo Clinic.